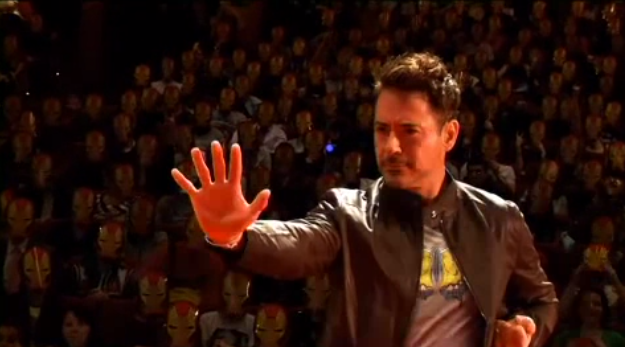 Here's a brief clip of Robert Downey Jr. in Moscow promoting "Marvel's - Iron Man 3" including some great hand-held camera shots! Enjoy! Downey takes time to pose with the crowd creating some modern pop art! "Iron Man 3" is presented by Marvel Studios in association with Paramount Pictures and DMG Entertainment. Marvel Studios' President Kevin Feige is producing and Jon Favreau, Louis D'Esposito, Charles Newirth, Victoria Alonso, Stephen Broussard, Alan Fine, Stan Lee and Dan Mintz are executive producers. Thanks to Walt Disney Studios Publicity for the cool footage, used by permission.